Dr. Kenneth Harris wears many hats at Concordia University Wisconsin and beyond. 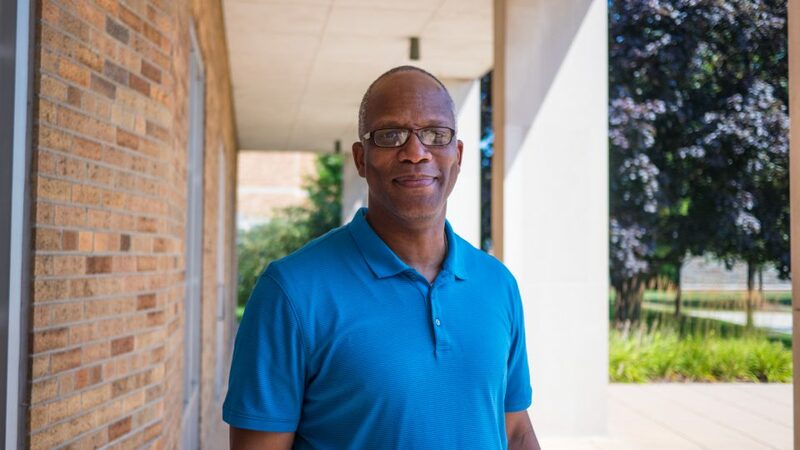 He is the Program Director for the Masters in Organizational Leadership Administration program, Department chair for Justice and Public Policy, and Chair on the JPP Advisory and OLA advisory councils. Outside of his work with Concordia, he serves at a Milwaukee Police Lieutenant Shift Commander. We caught up with Ken during his spare time to talk about his background, Concordia’s business school, and some student insight about the school’s offerings. EXPLAIN WHAT YOU DO FOR YOUR ROLE AT CUW. With all of my Concordia University roles, I do many of the same tasks. I help create new programs and curriculum, enhance the programs, hire and train faculty, and make sure the programs are as cutting edge and rigorous as possible for higher education. HOW IS FAITH INTEGRATED INTO YOUR ROLE? Faith is something that you live everyday. For me, it’s something that also informs my decision making. One of my roles involves hiring new faculty and I take a step further than most people by analyzing their faith. We each have a mission when it comes to our faith. To start, I have a Bachelor of Science degree in Mass Communication from Illinois State University. From there, I obtained my Bachelor of Arts in Criminal Justice Management from CUW, an MBA in Finance and Risk management from CUW, and then finally I got my Ph.D. in Leadership Studies from Marian University. I also have been a teacher on numerous occasions. I taught at Columbia College in Chicago where I had Radio and Production classes back in the old days when you had to use your hands with video tape. I then went to Chicago public high schools for a while after that. At the Police Academy I taught classes because I have 4 of the 5 tactical instructor certifications. I even taught at Marian University and here at CUW as well. I’ve really taught in every capacity of job, if I don’t teach then I don’t feel like I’m doing what God called me to do. WHAT INITIALLY BROUGHT YOUR TO CONCORDIA? My children graduated from Missouri Synod elementary schools; from the mid-90s until a few years ago my children have been going to Lutheran schools. I was always impressed with the educational side of the Lutheran church and I’ve gotten to know a lot of the staff because our children went to school together. Concordia has turned into a “safe” place…if I’m not having a good day, there is always someone I can talk to that, on a spiritual level, will give me sound scripture advice. That’s really what keeps me coming back no matter what goes wrong; Christ is always at the center of that and I can rely on him. WHAT ARE SOME OF THE QUALITIES OF THE STUDENTS YOU SEE AT CONCORDIA? I have seen students from all walks of life; those who have struggled to get into college and those who are straight-A students all the way through. Students I have truly seen excel in Organizational Leadership and Criminal Justice are ones who have struggled in life. These students recognize their identity, their perseverance, and persistence and because of that they know why God put them here. College teaches you that life is a struggle and I always tell students if you can make it through college, you can make it through anything and nothing can stop them. WHAT MAKES CONCORDIA UNIVERSITY’S BUSINESS SCHOOL UNIQUE? It’s unique because the entire gist of the school is based on practicality. You have faculty that have actually done what they teach. You can’t teach marketing if you haven’t done it; you can’t teach criminal justice if you haven’t done it. We teach what we do. HOW DO YOU SEE CONCORDIA’S MISSION BEING FULFILLED? At graduation twice a year when students tell me they got jobs. This is the first year I’ve had 10-15 students call me back in need of a letter of recommendation because they’re in the final stages of a job interview. That’s so wonderful to hear! WHAT GIVES YOU THE MOST SATISFACTION IN YOUR ROLE? I think the best satisfaction is when a student said to me they couldn’t finish their degree because they got a job so quick. So we helped them transition over to online because that degree was one of the first ones to be completely online. I love being able to work with the students in any circumstance to help make sure they finish their degree. WHAT ADVICE WOULD YOU GIVE PROSPECTIVE CONCORDIA UNIVERSITY STUDENTS? I would suggest to them to shop around; they’ll realize that Concordia really offers the “meat and potatoes.” Concordia offers the skillsets they need to be able to go somewhere. We are a private, Christian university that recognizes how quickly things can change. There are many different educational offerings so you are able to find the track that perfectly fits you. I have personally attended and worked at both private and public schools, and none of them offer anything like what Concordia does to students. WHAT DIFFERENT TRACKS CAN STUDENTS TAKE IN THE BUSINESS PROGRAM? Our business school is very broad in that it offers qualitative and quantitative options; marketing, management, accounting, forensic accounting, criminal justice, organizational leadership, organizational communication and negotiation, etc. We offer you practical degrees with hard and soft skill teachings and things that most business schools don’t normally teach. We are also flexible enough in which you can get a general business degree and touch all the areas that are relevant to what you want to do. The possibilities are endless!